Located a little over two hours from Sacramento, the tiny town of Murphys is barely a blip on the map. And although that’s not such a good thing if you need the services of a metropolitan city, it’s just what the doctor ordered if you’re seeking refuge from the hustle and bustle of city life. 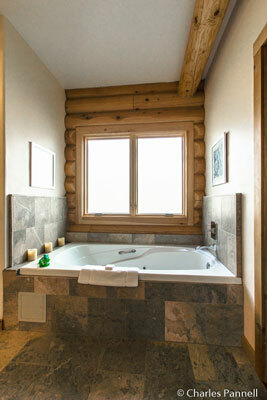 And the newly opened CourtWood Inn (www.courtwoodinn.com) is the perfect place to get a heaping helping of the latter. Perched on a pine-covered hillside just outside of town, this five-room tennis-themed inn is the brainchild of Larry and Chris Parker. 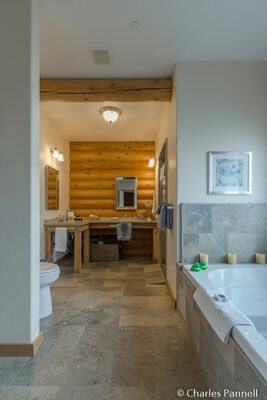 It’s named for two things that this tennis pro couple holds near and dear — the game of tennis and their lovely three story cedar log lodge. And although local codes didn’t require an accessible room, the Parkers opted to include one, so everyone can enjoy this peaceful mountain retreat. 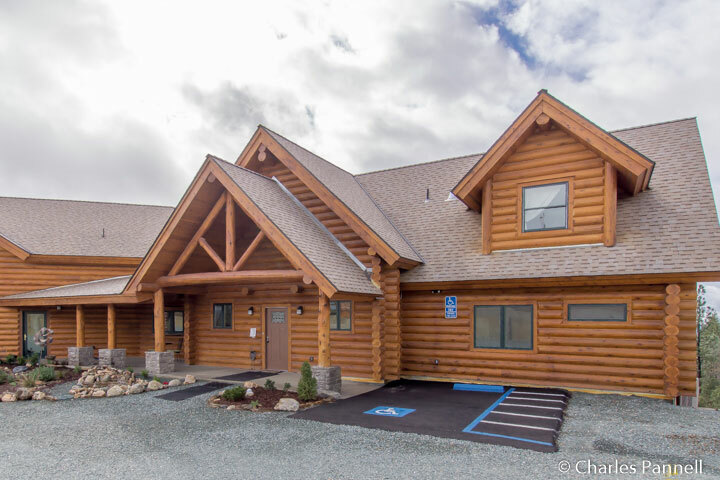 Access is excellent at the inn, with accessible parking just steps from the front door, and level access to the entrance. Inside, there’s barrier-free access throughout the great room, which offers a magnificent view of the pine-studded hillside. In keeping with the tennis theme, each guestroom is named after a grand slam event, and decorated with items reminiscent of the host country. The accessible US Open room is located right off the great room. Access features in the US Open room include wide doorways, level access and plenty of room to maneuver even the largest wheelchair or scooter. 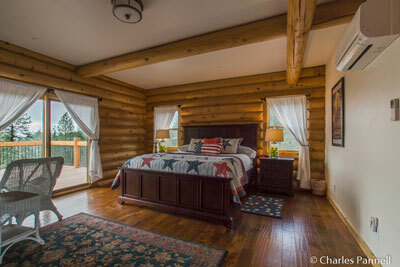 It’s furnished with a 32-inch high king-sized bed, but with advance notice it can be replaced with a lower bed. Other furnishings include two bedside tables, a chest of drawers, two chairs and a small table. Decorated in a red, white and blue palette, the color scheme reflects the location of the US Open; while rackets, balls and even a poster for the event can be found throughout the room. And for a bit a local flavor, the room also comes adorned with a stuffed frog, in honor of Mark Twain’s famous short story, The Jumping Frog of Calaveras County. 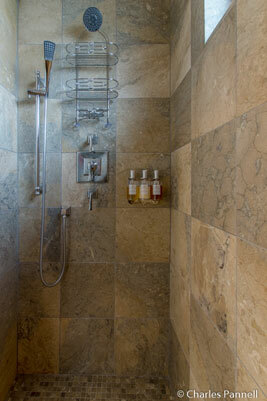 The bathroom is equipped with a tiled roll-in shower with a built-in shower bench and a hand-held showerhead. A portable shower chair is also available. 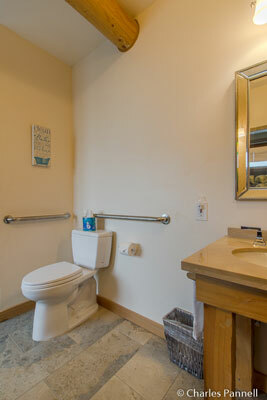 Other access features include a roll-under sink, and toilet grab bars on the back and right walls (as seated). There’s also a hydrotherapy tub in the bathroom, and in keeping with the Calaveras theme, the standard rubber ducky has been replaced with a rubber frog. 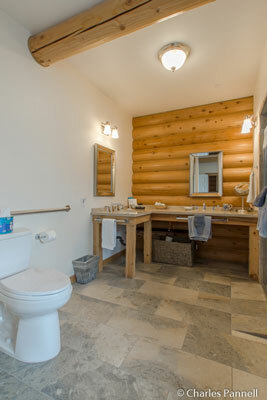 There’s also a refrigerator and a coffee maker in the large walk-in closet, which is adjacent to the bathroom. One of the best features of this room is actually located outside — the large deck that offers a great view of the surrounding forest. There’s level access to the deck through a sliding door, and plenty of room to roll around outside. It’s a nice place to watch the sunset or enjoy a quiet morning cup of coffee. There’s also barrier-free access to the dining room, where Chris serves up a healthy breakfast every morning. And don’t miss happy hour in the great room, which features local wines and goodies from the kitchen. Although it took the Parkers nearly two years to build their dream inn, they’re not quite through yet. Their eventual goal is to build tennis courts on the property and offer private tennis lessons to their guests. It seems a fitting goal for two former professional tennis players, and a great addition to this tennis-themed inn. So check back often — you never know what else the Parkers might have up their sleeves.